The 36 Megapixels of the D800 produce large files. One click equals 38-59 MB (RAW, 14-bit, lossless compressed). This means that with a 4 GB-card I use as secondary card in my D300s only 60-80 images can be taken. That’s about two rolls of film. Therefore I needed bigger memory cards and bought a Sandisk Extreme Pro 16GB SD card and a Kingston ultimate 600x 16GB CF card last year in preparation of the D800 arrival. Now I have to learn the hard way that buying cards before the camera is a bad idea, because the Kingston card is not recognized by the D800. After insertion the memory card access LED lights up for 10-15 sec, after that an error message is displayed. I tried a Sandisk CF card in the D800 – no problem. 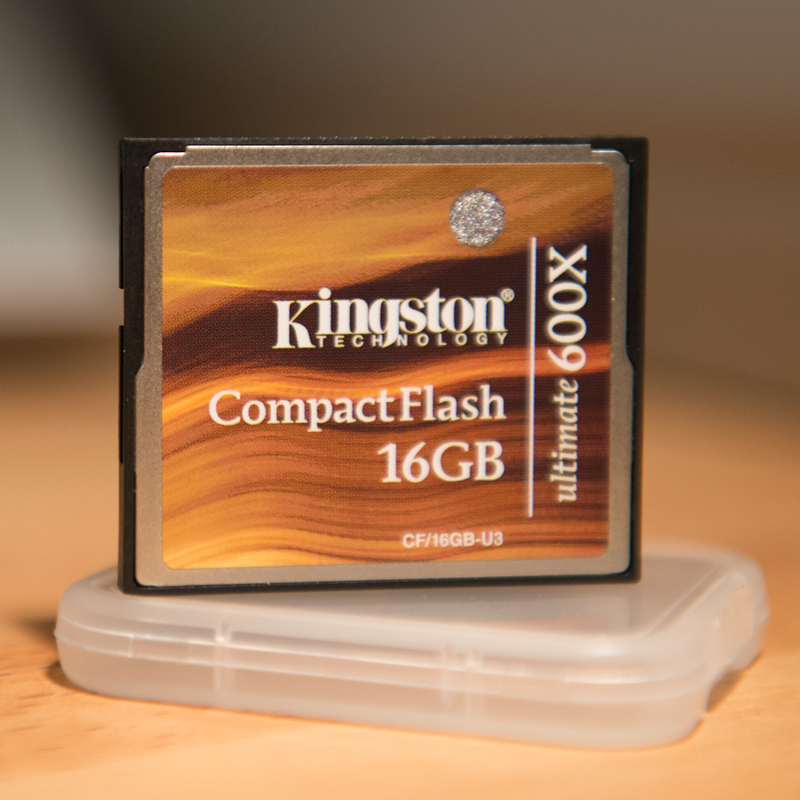 I tried the Kingston CF card in a card reader and in the D300s – no problem. Only the combination Kingston / D800 won’t work. The D800 manual states that Nikon only tested Sandisk and Lexar cards with the camera. Cards from other manufacturers _might_ also work, but Nikon can not guarantee that. That is also pretty much what Nikon support told me when I mailed them. Funny thing: According to Nikon the D300s was also tested with Sandisk and Lexar cards only. But the Kingston card works in the D300s without any problems. On the facebook-page of NikonRumors.com a D800 user also reported that his 32 GB Kingston CF card won’t work. Also I found a list on Wynner’s blog about cards which may and may not work work with the D800. Bottom line: D800 users – stick to Sandisk and Lexar cards. I ordered a Sandisk 16GB card from Amazon and am trying to re-sell the Kingston card. Interested ? Then drop me a line. The card has not been used actively, only for testing. It is as good as brand new. Transcend cards are working just fine too. I have the 2x32GB Kingston CF memory 266X, they work fine with my D700 and D3s.But know with the new and very famous camera “D800” is not working.I’m a very old Nikon fan, but this issue is very non usual with Nikon.Why they sale a super high resolution camera and we can’t use our memory.Nikon don’t make people to get some bad opinions! Lexar 64GB Professional 600x SDXC UHS-I works with the D800; however, I can’t read the content from a MacBook Pro reliably (15″, 2011 model, built-in SDXC reader). * write-protect the SD card to prevent OS X from writing to it. * Formatting (ExFAT) using OS X Lion. * Formatting using SD Formatter 3.1. Thanks for the input, I will try that next time my card jams. Same issues here. I have a kingston 16 gb and a D800. It works with my older nikons, but not the D800. Looks like I’ll be returning the kingston. I think I have 2 days left to. It takes more then 20 seconds to write 1 raw file. All my other cards do the same job in 5 seconds. I recieved my d800e this morning and have been on the net ever since trying to find a fix to the SDCard and CF problem – I have found a fix that has worked for me. Verbatrim & Kingston 8GB SD Card working fine, also Duralcell Pro Photo 600x Compact Flash also works. To get these cards to work you have to do the 2 button format. Hold down the mode button and the trash button and the card will format – the display will show for (flashing) Then let go of both buttons. Then press both buttons again to stop format mode. I tried that with my 16gb Kingston 266x and just keep geting ‘err’.